SCCR delegates will be presented with key global and regional data from the IFPI Global Music Report (which will be published globally during the week of the SCCR), insights into the partnerships between record companies and artists, and some key challenges to ensuring the sustainable and balanced development of digital music markets around the world. Musician, label owner, and music festival founder Miranda Mulholland will close out the event with remarks explaining how weak copyright legislation has impaired her career. 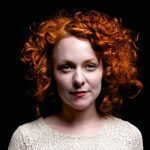 She will also reflect on the value of record labels in the modern music marketplace, and will demonstrate how artists can help establish a sustainable and functioning marketplace, outlining her own journey as an artist advocate. 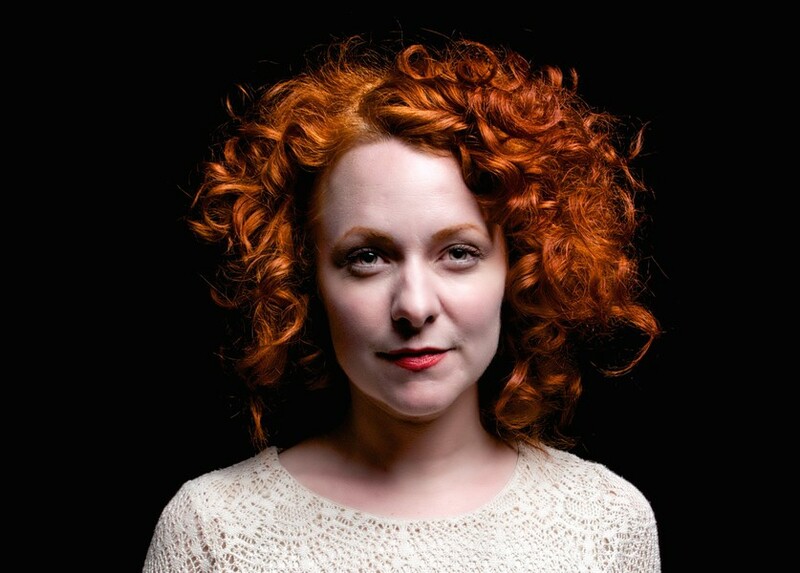 Mulholland will then take the stage with Andrew Penner, her musical partner in the band Harrow Fair, to perform their unique blend of folk, country and garage rock music. JUNO Awards week is here and Music Canada is gearing up for another spectacular few days celebrating Canadian music with our friends and partners in the music community. Last year at the JUNOS we showcased how our advocacy work benefits artists at every stage of their career with our #EveryStage campaign. This year, we aim to highlight the ways we’re working to improve the music ecosystem in Canada. With the support of our members, Sony, Universal and Warner, we’re committed to building a framework where music businesses can thrive, and artists can have sustainable and prosperous careers. A major pillar of Music Canada’s mandate is advocating for a functioning marketplace where music creators are paid fairly every time their work is used. Copyright is the bedrock of remuneration for the creators of recorded music. It enables them to receive payment when their recordings are copied or played in public, including on the Internet. In the age of streaming, it’s vital that copyright legislation and institutions be adaptive and responsive so musicians and labels are paid whenever their work is commercialized by others. Some of the ways that we’re working to strengthen copyright and boost investment in music are: successfully championing reforms to the Copyright Board of Canada that will make the Board’s processes faster, more efficient, and more predictable; calling for the elimination of copyright exemptions that syphon value away from music, and; encouraging provincial government investment in regional music economies, such as the BC Music Fund and Ontario Music Fund. 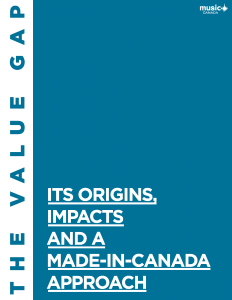 Music Canada has been a global leader in researching the Value Gap – its origins, the economic toll, and practical solutions the Government of Canada can implement to help fix the problem. Throughout the government’s current review of the Copyright Act, numerous music community representatives testifying before government committees referenced our report, The Value Gap: Its Origins, Impacts and a Made-in-Canada Approach, and presented the same four recommendations to government. It was abundantly clear that the Value Gap is a real phenomenon that is hurting creators and that it needs to be addressed. 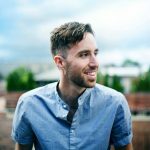 Its harm is felt across the music community – everyone from publishers and composers, to labels, and especially artists, are at a disadvantage because of outdated copyright legislation. 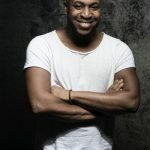 Because artists are the motor that drives the music industry, and the storytellers that music fans fall in love with, they are best equipped to communicate the serious and erosive effects the Value Gap is having on their careers, their economic livelihoods, and the wider music community. Music Canada is committed to supporting artist advocacy, because their stories truly resonate with the public and political decision-makers. We do this through support for discussions at music conferences, economic forums, and spreading the voices of artist advocates at our events and in our reports. In 2017, Music Canada embarked on an exhaustive organizational review to provide recommendations on ways we could demonstrate leadership in inclusion and good governance. At our annual Playback event in October 2018, we announced preliminary results of this review, including the addition of two new independent member positions on our Board of Directors to bring representation of women on our Board to 40%. We look forward to announcing further details on ways we’re working to reflect the exquisite mosaic that is our Canadian music community in the coming days. 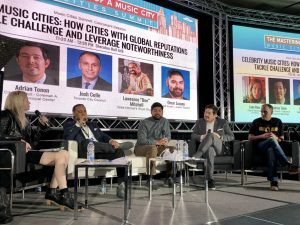 Bringing measurable inclusivity and accountability for the music industry was the topic of one of our major annual events in 2018 called the Global Forum at Canadian Music Week. We were proud to host Dr. Stacy L. Smith of the Annenberg Inclusion Initiative, the leading think tank in the world studying issues of diversity and inequality in entertainment. 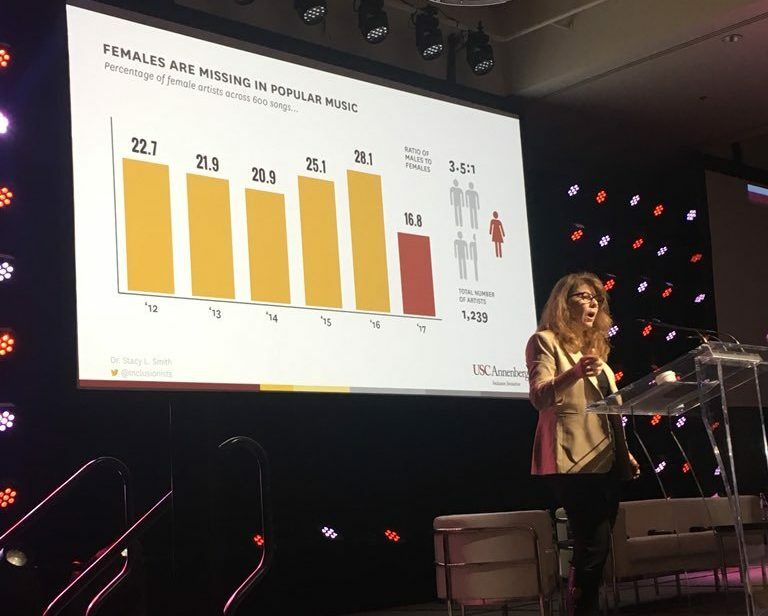 Dr. Smith pioneered the now popular “Inclusion Rider,” and at the Global Forum, spoke to her organization’s research into inclusion in the music industry. 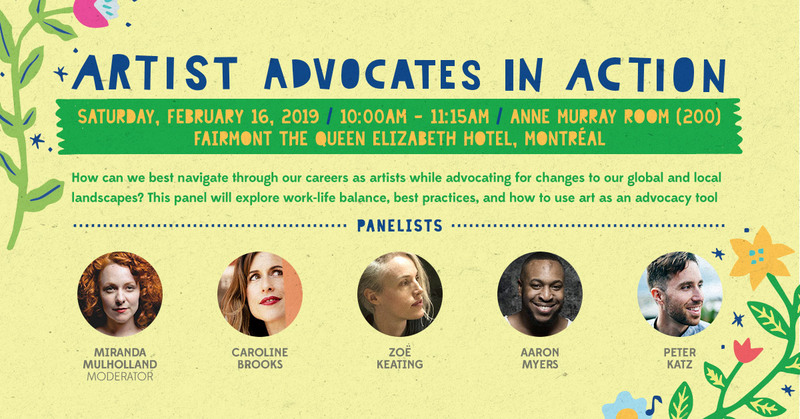 During JUNOS Weekend 2019, we’re pleased to be supporting CARAS’ Allies in Action event, focusing on action undertaken or underway in the Canadian music community to create safer and more inclusive workplaces and environments for industry members, artists and music fans. Since the publication of our 2012 report Accelerating Toronto’s Music Industry Growth, Leveraging Best Practices from Austin, Texas, Music Canada has become an internationally renowned source for research into policies municipalities can implement, and actions they can take to activate the full potential of their music economies. Our leadership in Music Cities was further cemented with the publication of our groundbreaking The Mastering of a Music City report in 2015. 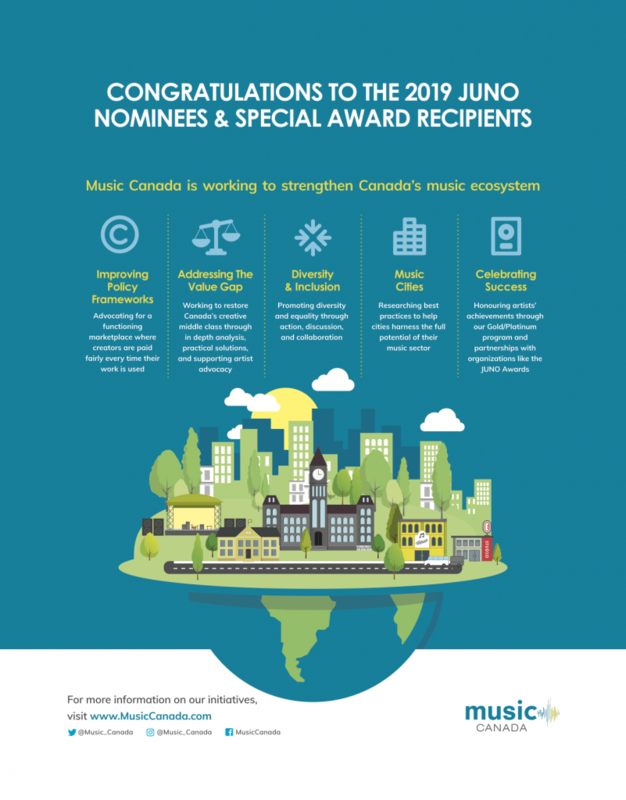 Since the release of these reports, we’ve seen phenomenal traction in Canadian cities like Smithers, Vancouver, Toronto, Ottawa and 2019 JUNO Awards host city London. These cities have all formulated an official music strategy, and some have established a music office, or officer position, within their municipality. 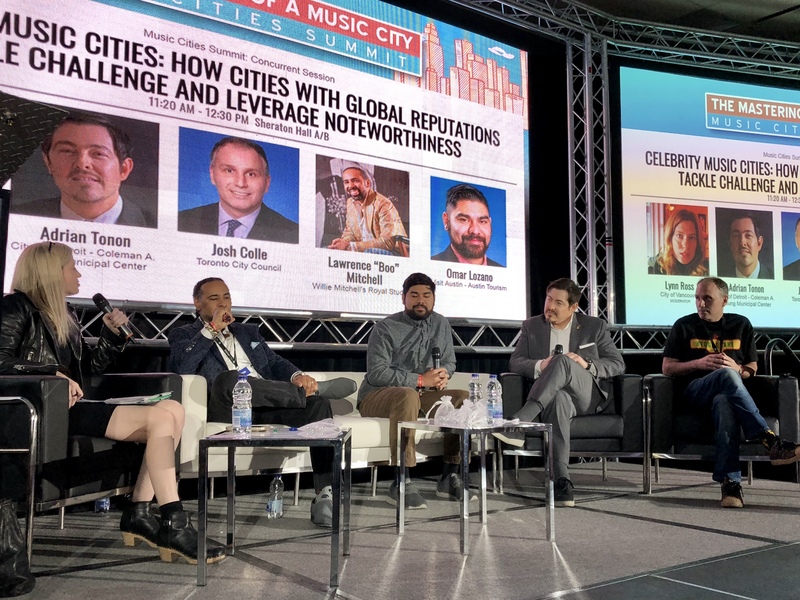 In addition to presenting our research at Music Cities events across the globe , Music Canada will host its third annual Music Cities Summit at Canadian Music Week in May of 2019. 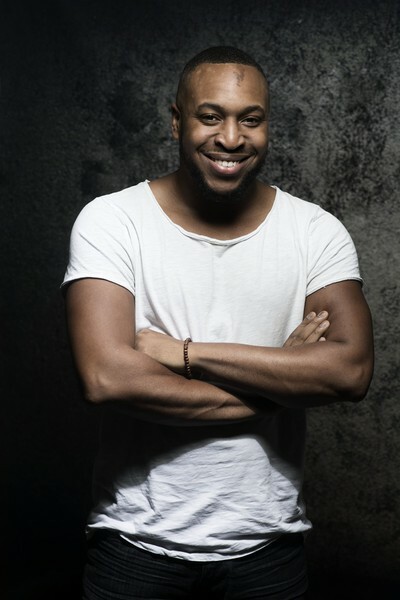 Look out for details on the 2019 Music Cities Summit, including featured speakers and other program elements in the coming weeks. Music Canada is proud to return as a sponsor of the Album of the Year category, as well as the Presenting Sponsor of the Chair’s and Welcome Reception on Friday, March 15. With our sponsorship of the category and continued partnership with the JUNO Awards, we join music fans across the country in celebrating the works from this year’s nominees – Hubert Lenoir, Jann Arden, Shawn Mendes, The Weeknd, and Three Days Grace – and congratulate the dedicated label and production teams involved with each release. Throughout the year, we also join fans in celebrating their favourite artists’ first certification milestones to a lifetime’s worth of achievements with our historic Gold/Platinum program, which was launched in 1975 to celebrate milestone sales of music in Canada. 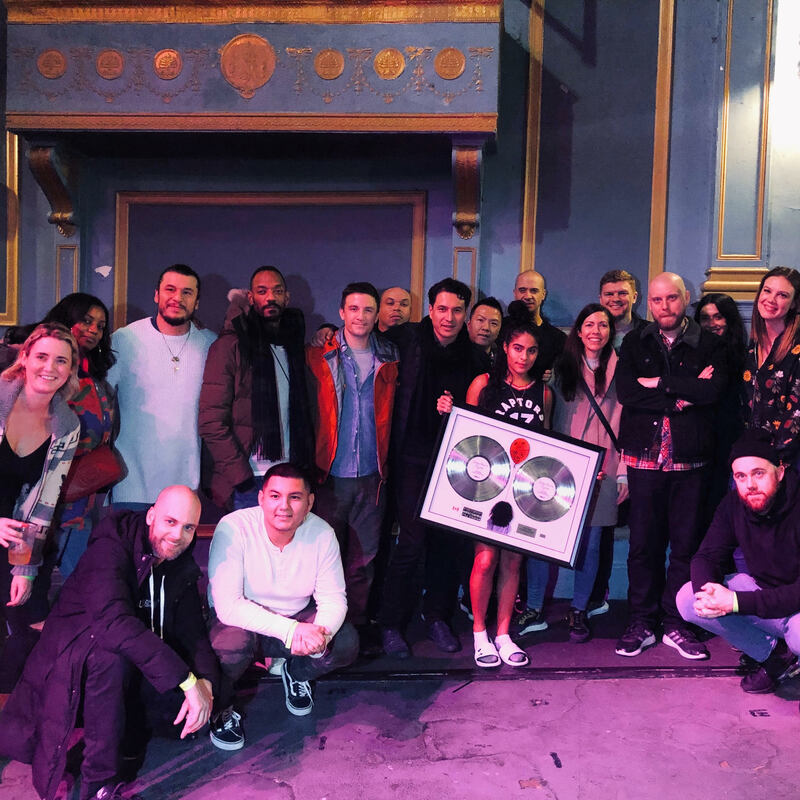 Today, artists can receive new certifications for the combined sales and stream equivalents of their singles and albums, and are often surprised with a tangible recognition of national success by their labels’ devoted teams. Certifications are shared on our Gold/Platinum Twitter, Instagram, and Facebook accounts, and the latest Gold certifications are added to our #GoldinCanada playlist every Thursday. Music Canada also presents two awards, our President’s Award and Artist Advocate Award, during Playback, our annual industry dialogue and celebration. So far, artists Miranda Mulholland (2017) and Loreena McKennitt (2018) have been honoured with the Artist Advocate Award in recognition of their outstanding advocacy efforts to improve the livelihoods of music creators. Meanwhile, the President’s Award, which is presented to an individual working outside the music community who displays a deep passion for music and the people who make it, has been received by Music Cities champions including former Toronto City Councillor Josh Colle (2018), and co-recipients Cory Crossman, London Music Industry Development Officer, and Chris Campbell, Director of Culture and Entertainment Tourism at Tourism London, who were instrumental in bringing the JUNOS to London this weekend for the very first time. A full rundown of JUNOS Week events is available on the JUNO Awards website. Tickets to The 2019 JUNO Awards Broadcast are available online at budweisergardens.com, by phone at 1-866-455-2849 and in-person at the Courtesy Ford Box Office at Budweiser Gardens (Located at Gate 1). In October 2018, Canadian musician and artist advocate Miranda Mulholland participated in the the World Trade Organization Public Forum 2018 in Geneva as part of a panel discussion on the future of innovation and creativity. The panel also featured Richard Bagger, Executive Vice President, Corporate Affairs and Market Access at Celgene, and Nicholas Hodac, Government and Regulatory Affairs Executive, IBM, and was moderated by Ellen Szymanski, Executive Director, Global Innovation Policy Center, U.S. Chamber of Commerce. 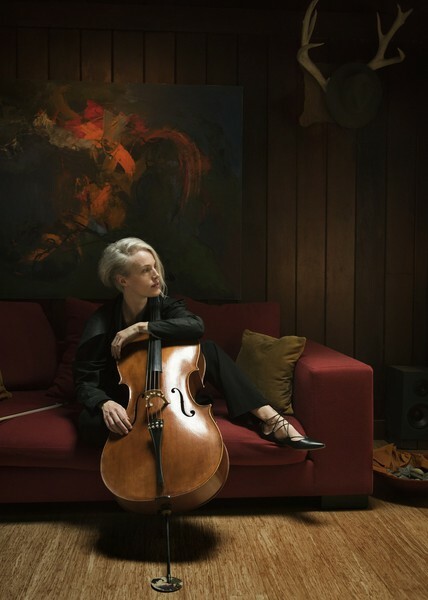 In her remarks, Mulholland provided a stark picture of the current realities of artist remuneration in this increasingly digitized musical landscape. 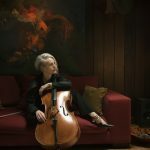 She outlined the differences in opportunities for artists in the 1980’s and 1990’s, whose earnings sustained their livelihood and enabled them to enter the middle class – in a way that artists today are simply not able to. Indeed, rapid technological and digital advancements has meant that music has become instantly accessible, in a variety of mediums and services. Yet, the remuneration of creators and musicians for the use and commercialization of this work has not matched the pace of these developments. Mulholland connected this reality to the phenomenon of the Value Gap: the significant disparity between the value of creative content that is accessed by consumers, and the revenues that are returned to its creators. She ended her remarks by reflecting on the positive regulatory and legislative steps that have been occurring at the federal level worldwide. Canada’s ongoing statutory review of the Copyright Act, as well the EU’s review of the Copyright Directive have both created opportunities for meaningful reforms that better protect creators. Watch Miranda Mulholland’s full remarks below. Last week, TVO’s The Agenda with Steve Paikin focused an episode on “Copyright for the Digital Age,” which featured impactful remarks on the importance of fair copyright for creators by Canadian musician, label owner and music festival founder Miranda Mulholland. Joining Mulholland on the panel discussion were composer Donald Quan and activist and author Cory Doctorow. Mulholland, who has been increasingly sought-after as an artist advocate, brought a clear and personal message to the discussion. Paikin: “Miranda, how about for you – how much does copyright matter to your bottom line? Although the Music Technology Policy blog has identified some examples of what Chris Castle deemed “sloppiness” in the questions – such as The Agenda citing a crowd-sourced job search site to suggest Canadian authors earn an annual salary of $61,798; a marked departure from The Writers Union of Canada’s study finding an average annual income of $9,380 – Mulholland calmly disputed the flawed statistic. 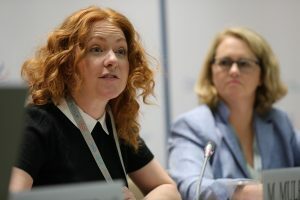 After Paikin cited a quote opposing copyright protection measures from German MEP Julia Reda, whom Paikin neglected to mention is the sole member of the European Parliament from the Pirate Party, Mulholland expertly brought the conversation back to focus on the need for regulations that supports creators. This clear response to this topic shows why Mulholland is increasingly being invited to speak on artist rights issues. She recently appeared at the World Trade Organization Public Forum 2018, presented a keynote at the Banff World Media Festival, and delivered a keynote at Midem 2018. 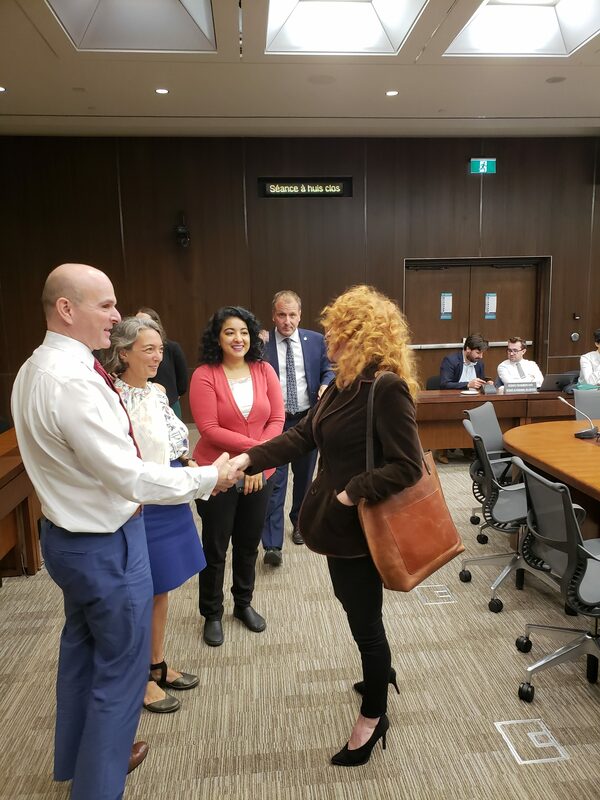 Mulholland also made an impactful appearance before the Standing Committee on Canadian Heritage’s study of remuneration models for artists and creative industries, where she shared her personal experience as an artist living in the Value Gap. She also called for action for creators in the NAFTA negotiations at an ACTION for Trade event in Washington, D.C., and was the first creator to deliver a keynote address at the Economic Club of Canada. The full program is available on TVO’s website, and is embedded below. On October 16, 2018, at The Great Hall in Toronto, Music Canada hosted Playback 2018, our annual industry dialogue and celebration. Close to 100 members of the Canadian music industry were in attendance, including representatives from record labels, awards programs, royalty collectives and funding institutions, as well as artists, journalists, politicians and other government representatives. Universal Music Canada President Jeffrey Remedios opened the event with a reflection on the state of the industry before Music Canada Executive Vice President Amy Terrill recapped Music Canada’s major accomplishments and new initiatives from the last 12 months. Those accomplishments include our work to close the Value Gap in Canada, the launch of Music Canada Cares and its first program, The Three Rs Music Program, exciting partnerships with other industry groups, and our latest research report, Keys to a Music City: Examining the Merits of Music Offices, Boards, and Night Mayors. You can watch Terrill’s full presentation below. Near the end of the presentation, Terrill gave the audience a sneak peek of a just-released video taking you behind the scenes of the production process of our Gold and Platinum award plaques. Following the annual review, Terrill invited Music Canada President and CEO Graham Henderson to the stage for a special announcement. Henderson shared preliminary results of Music Canada’s year-long, comprehensive governance review that Terrill had announced a year earlier at Playback 2017. To learn more about the changes resulting from the review, read our release. Stay tuned for more video content from Playback 2018 in the coming days, including a keynote presentation from professor and author Debora Spar, and a ‘fireside chat’ between Recording Industry Association of America Chairman and CEO Cary Sherman and musician, label owner and festival founder, Miranda Mulholland. 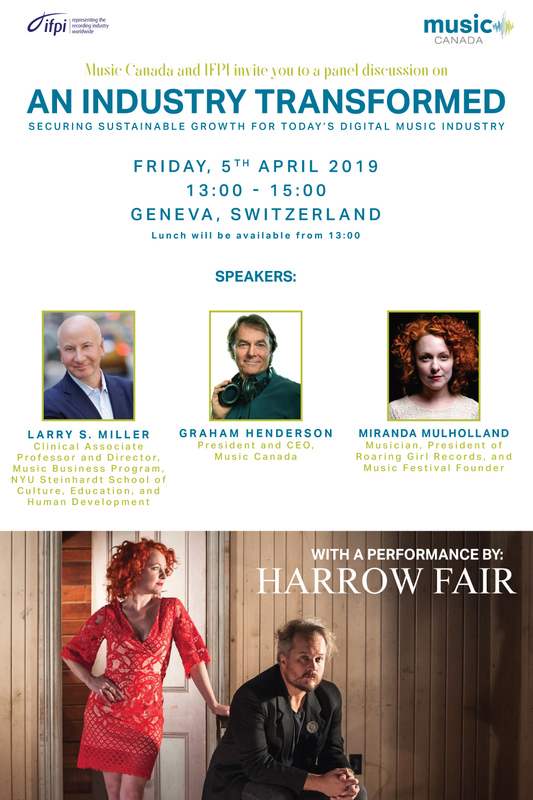 On Thursday, Canadian musician, label owner and music festival founder Miranda Mulholland will participate in the World Trade Organization Public Forum 2018, as part of a panel discussion on the future of innovation and creativity. The Public Forum includes more than 100 sessions organized by NGOs, governments, academics, other international organizations, and the WTO secretariat. This year’s theme is “Trade 2030”, as the Public Forum examines how the increasing pace of technology changes will affect sustainable trade, technology-enabled trade, and a more inclusive trading system in the year 2030. The panel, which is presented by the U.S. Chamber of Commerce, is titled “Investing in the future of innovation and creativity – Promoting environmental sustainability, medical breakthroughs, artificial intelligence, and cultural expression,” and takes place on Thursday October 4th at 10am in Room D of the World Trade Organization headquarters in Geneva, Switzerland. The panel will also feature Richard Bagger, Executive Vice President, Corporate Affairs and Market Access at Celgene, and Nicholas Hodac, Government and Regulatory Affairs Executive, IBM, and will be moderated by Ellen Szymanski, Executive Director, Global Innovation Policy Center, U.S. Chamber of Commerce. 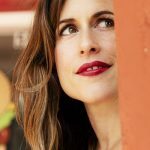 In addition to her impressive resume as a classically trained violinist and vocalist, Mulholland is becoming increasingly well-know internationally for her advocacy work. 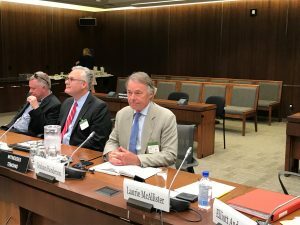 She recently appeared before the Standing Committee on Canadian Heritage’s study of remuneration models for artists and creative industries, where she shared her personal experience as an artist living in the Value Gap. 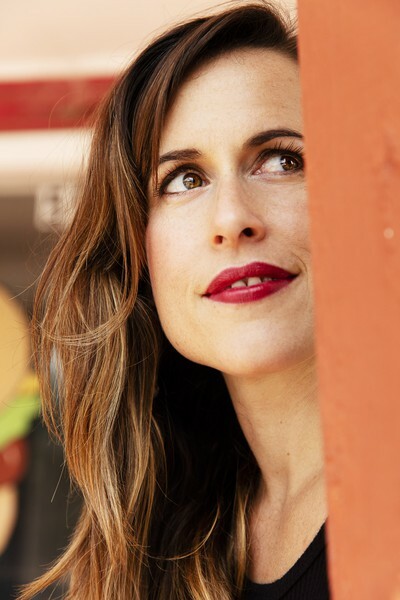 Earlier this year, she delivered keynote addresses at the Banff World Media Festival and the Economic Club of Canada in Ottawa, as well as speeches internationally at Midem and an Action For Trade event in Washington, DC. 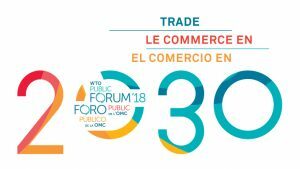 Music Canada urges any of our international colleagues attending the WTO Public Forum to attend this important panel, which will provide an insightful look ahead at what cultural expression and the creative industries may look like in 2030. For those unable to attend in person, the World Trade Organization will be posting audio from the panels on their website following the Forum.